TweetDeck is an awesome desktop client for Twitter. It has number of features to make twitter experience easy and quick. By default all weblinks shared via tweets on Tweetdeck use bit.ly URL shortening service. 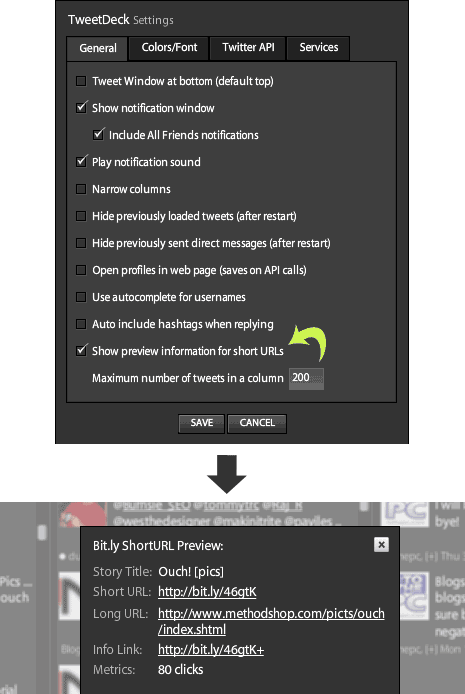 Tweetdeck has option to see click statistics and actual URLs of all bit.ly URLs in tweets you send or follow. Click on settings icon on top-right part of tweetdeck window. Under ‘General’ tab, check the option ‘show preview information for short URLs’ and click the save button. Now click on any bit.ly URL in any tweet to see pop-up box showing actual URL and click statistics for that URL. One cool and easy way to track number of clicks on weblinks you share on Twitter. Didn’t know TD had this feature already, have wanted access to this data ever since I started using it..Thanks for the post!